The Cane Corso is a large breed mastiff that originated in Italy, which is why the dog is sometimes referred to as the Italian Mastiff. While descendants of the breed were Roman war dogs and guard dogs, the modern Cane Corso can be found hunting game, working on the farm, or in the comfort of your home. But regardless of where they spend their time, they are powerful, athletic dogs in need of a high-quality diet. Hunting for the right dog food can be a challenge, however – but we’re up for it. To make finding the best Cane Corso food a breeze, take a look at our expert recommendations! According to the standard for the breed, the Cane Corso typically weighs between 88 pounds (small female) and 110 pounds (large male). They usually stand between 23 and 28 inches tall, with females being at the smaller end of the scale. However, the breed is energetic, especially as growing puppies and as young adults. They require a diet that features good quality protein. According to the National Research Council of the National Academies, an active adult Cane Corso dog weighing 90 pounds requires an average daily caloric intake of 2100 calories. Dogs that have been spayed/neutered, or that are older, may need fewer calories. Some dogs may need more calories depending on their level of activity and their individual metabolism. Growing puppies, for example, consume more calories than adult dogs and so do young adult dogs. A young adult Cane Corso dog weighing 90 pounds needs an estimated 2164 calories per day. Protein is very important for your dog’s diet. The Association of American Feed Control Officials (AAFCO) recommends a minimum of 22 percent protein for growth (puppies) and 18 percent protein for maintenance in adult dogs. Most good quality dog foods will far exceed these percentages. Fat is an important source of energy for dogs and should comprise at least 8 percent of the diet for Cane Corso puppies and 5 percent of the diet for adults. While some people like to feed their Cane Corso a raw or homemade diet, you should be able to choose a good commercial dog food for your puppy or dog. Protein and fat are the main ingredients in the diet for a Cane Corso, as they are for most dogs. However, not all protein and fat are the same. It’s important that the protein and fat in the dog food come from good sources if you want your dog to be healthy. Protein – Ideally you will select a dog food that features two or three meat proteins in the first several ingredients listed. Both whole meats and meat meals are good sources of protein. Whole meats refer to foods such as whole chicken, beef, fish, and lamb, while meat meals are a concentrated form of meat in which the moisture is removed. Fat – Look for named fat sources such as chicken fat. Other named fats also provide needed nutrients such as fish oil which can provide omega-3 fatty acid to help keep the skin and coat healthy. Puppies can benefit from DHA, a specific form of omega-3 fatty acid that helps with brain development. Older dogs seem to benefit from medium chain triglycerides which feature medium chain fatty acids (MCFAs). They are often made from a combination of coconut oil and other oils. Avoid – If you want to avoid corn, soy, and wheat in your dog food, your Cane Corso may still be able to eat rice, barley, oats, or some other grain or cereal. Or you can choose a dog food that uses an alternate source of carbs such as sweet potatoes. As large breed puppies, Cane Corsos have some special requirements. Because of the breed’s large size as adults, it’s very important to feed Cane Corso puppies a large breed puppy food. These formulas have slightly less protein, as well as less calcium and phosphorus than other puppy foods which is important for large breed puppies. It’s also important to make sure that the calcium to phosphorus ratio is accurate – 1.2 parts calcium to 1 part phosphorus. 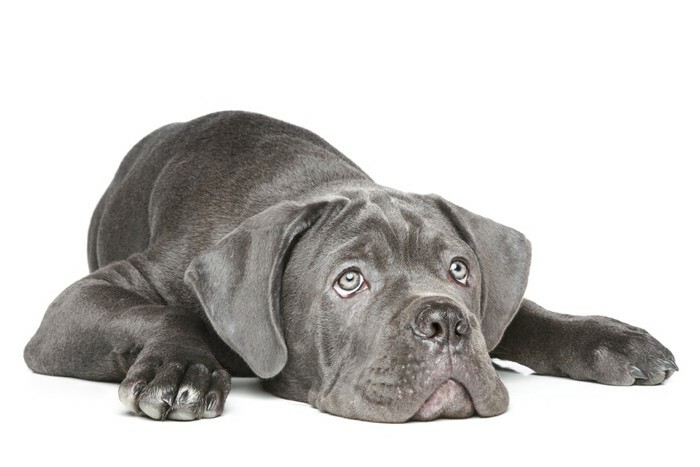 Blue Buffalo’s puppy formula is loaded with health benefits for a growing Cane Corso, including DHA for brain and eye development and fresh, high-quality protein, fat, fruits, and vegetables. It contains the proper calcium to phosphorus ratio and is completely free of corn, wheat, soy, or poultry by-products. Similar to Fromm’s Large Breed Gold Adult formula, this large breed puppy formula contains no corn, wheat, or soy. The first three ingredients are duck, chicken meal, and chicken. Protein, fat, and calories are moderate to help large breed puppies grow slowly. The technical analysis for the food shows the correct calcium to phosphorus ratio for large breed puppies. Fromm Large Breed Puppy Gold formula also has added DHA-rich salmon oil for good brain and eye development in puppies. The USDA-inspected ingredients for the food are delivered fresh each morning. 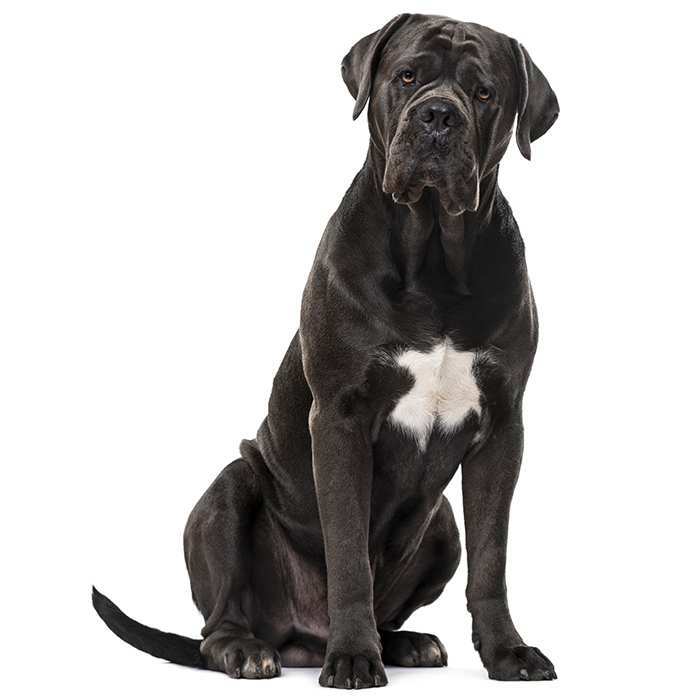 This large breed puppy formula features probiotics, healthy fiber, and digestive enzymes to help your Cane Corso puppy digest the food better and absorb more nutrition. Other natural ingredients include chicken and fish meal. The formula supports muscle and bone development, as well as brain and eye development (from DHA). Protein and fat levels are lower, which is desirable for growing large breed puppies. Designed specifically for large dogs more than 50 pounds, Fromm Large Breed Adult Gold is one of our favorite dog foods for large dogs. It contains duck, chicken meal, and chicken as the first three ingredients. Chicken cartilage is added for a natural form of glucosamine to keep joints supple which is important for large dogs like the Cane Corso. It is free of wheat, corn, and soy to help with digestion. Fromm Large Breed Adult Gold features moderate protein, fat, and calories which is better for large dogs like the Cane Corso. 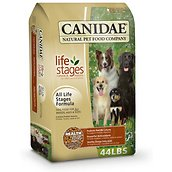 Canidae is another brand recommended by Cane Corso breeders. Their All Life Stages formula features four meat protein meals – chicken, turkey, lamb, and fish. It includes guaranteed levels of probiotic cultures to help with digestion. This could be helpful for any breed that has problems with bloat. The food also has guaranteed levels of antioxidants to help support the immune system. This food is free of wheat, corn, soy, fillers, antibiotics, hormones, artificial flavors, colors, or preservatives. 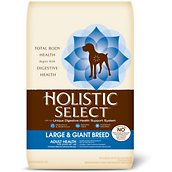 Holistic Select is considered one of the best dog foods made today. This recipe is formulated with large and giant breeds in mind. It has a Digestive Health Support System that includes active probiotics, healthy fiber, and digestive enzymes, which can help with bloating. And the food has added glucosamine which is helpful for healthy hips and joints, especially in a breed such as the Cane Corso that is prone to hip dysplasia. Holistic Select makes many good foods, including grain-free foods. If you don’t like this particular food, you may find another food made by the company that would be more suitable for your dog. By the time your Cane Corso is about seven years old, he may begin to slow down and enter his early senior years. At this time, some dogs may start to gain weight for age-related reasons. It’s a good idea to have your Cane Corso checked by a veterinarian at this time. If your aging Cane Corso is a little plumper than he used to be, he might benefit from eating a senior dog food for mature dogs. These foods typically have fewer calories – and more filler ingredients – than foods for adult dogs. Their purpose is to make your dog feel full while giving him fewer calories so he will lose a few pounds. The best foods for older dogs will have more protein and fewer carbs. The following suggestions contain additional beneficial ingredients, like glucosamine and chondroitin for joint health, as well as antioxidants and probiotics. We like Orijen Senior, especially for a large breed like the Cane Corso. The recipe has a higher protein and lower carbs than many dog foods, especially many senior dog foods. It provides protein from excellent meat sources. It does provide some grain from steel-cut oats but its low-glycemic. 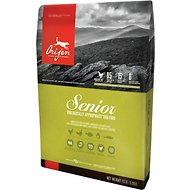 We think this food should keep most older dogs feeling full so they don’t get hungry. It also adds glucosamine and chondroitin to the formula to help with your older dog’s joints. The Cane Corso can be prone to several health problems that can be affected by diet such as hip dysplasia and gastric torsion or bloat. 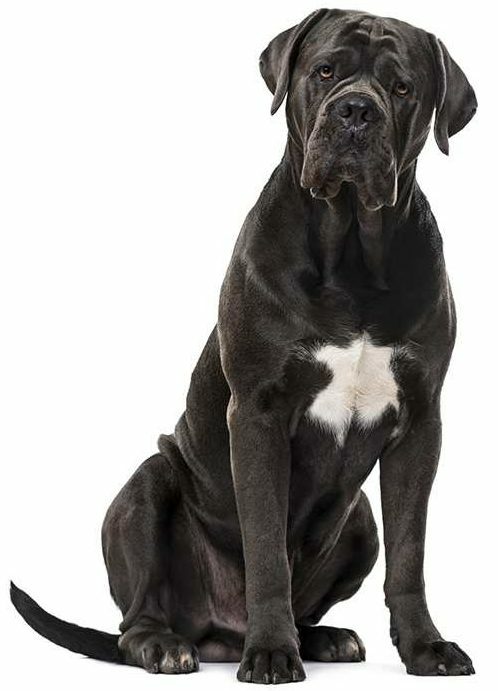 To help avoid hip dysplasia, feed your Cane Corso puppy a food specially formulated for large breeds, and switch to an adult formula when he is at about 90 percent of his full growth. As for helping with bloat, go for a grain-free food and feed your pup regular, scheduled meals throughout the day rather than free-feeding. Whether you are getting a new puppy or looking for a new food for your companion, we hope these recommendations help you choose the best food for your Cane Corso. For additional recommendations that would benefit the Cane Corso, take a look at the best large breed dog foods.